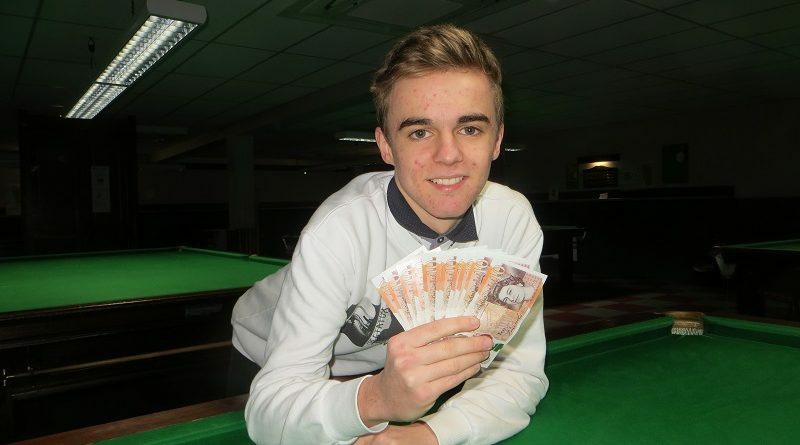 HE’S the youngest ever winner of the Tuesday Singles League at Chandlers Ford Snooker Club. Steven Hughes reckons “a mixture of good fortune and the will to win” saw him through the Series 22 top-eight play-off. The 17-year-old pocketed £110 prize money after beating fellow Cuestars Under-21 Gold Tour player Ryan Hughes (no relation) 2-1 in the final. Steven took the opening frame on the pink, needed snookers with one red left in the next but left his 16-year-old opponent chasing penalty points on the colours in the decider. Reflecting on the evening’s drama, Steven said: “I made quite a few errors but I was able to pull it back in the end. Indeed, the Chandler’s Ford teenager – who is sponsored by Aquatec Plumbing & Heating – had fluked a re-spotted black to force a decider in his semi-final against Dan Hammond. Meanwhile, Ryan, who was also runner-up in Series 18, pulled off a major shock in his last-four match by knocking out 14-time champion Mitch Wade 2-0. A new ten-week scratch league kicks off at 8pm on January 8. In the 11th week, the top-eight compete in a knockout for the prize pot. For more details, ring the club on 02380 254834. Quarter-finals (£13.50): Steven Hughes 2-1 Marc Russell, Neil Carroll 0-2 (37) Ryan Hughes, John Barton (32) 1-2 (51, 48, 34) Mitch Wade, Dan Hammond 2-0 Dave Nunn. Semi-finals (£27.50): S Hughes (32) 2-1 Hammond. R Hughes (38) 2-0 Wade. Final (£110/55): S Hughes 2-1 R Hughes.